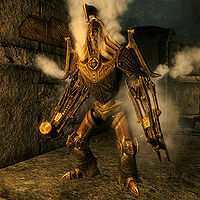 Dwarven Automatons (also known as Dwemer Constructs and Dwemer Animunculi) are various ancient, robot-like machines encountered in Dwarven Ruins across Skyrim and Solstheim. Despite the disappearance of the Dwemer after the events of the War of the First Council, their creations remain functional in long lost cities beneath the ground, performing whatever operation their masters tasked them with. Dwarven automatons come in all shapes and sizes, but ultimately they all follow a similar set of rules for how they function. They are non-living constructs that cannot be detected with Detect Life or Detect Undead, but can be detected with the Aura Whisper shout or the Vampire Lord's Detect All Creatures ability. For purposes of powers like Agent of Dibella, all automatons are treated as male. Automatons are immune to paralysis, cannot be ragdolled (except for Dwarven spiders), cannot be reanimated, cannot be soul trapped, and have a permanent Waterbreathing ability. Note that while they cannot be soul trapped, they do recharge enchanted weapons when killed by an actor with the Soul Siphon perk. Furthermore, contrary to what one might expect from reading Ruins of Kemel-Ze, Dwarven automatons are not immune to shock, which actually causes them normal damage. Instead, they are immune to frost and poison damage, and boast a 25% resistance to magic. Dwarven spiders are small, arachnid-like automatons, and are very common in Dwarven ruins. They tend to be found mining or working on building or maintaining various objects that are found in their ruins. They can also be found hiding inside of pipe ports along the walls and ceilings of these ruins where they will lay in wait until they notice something walk by, after which they will leap out and attempt to engage whatever alerted them. They are very agile in combat and will attack with a variety of leg stabs, and can also perform a leap attack that will both deal greater damage and close the distance between them and their target. 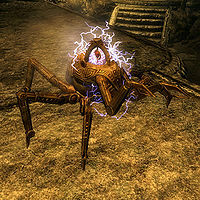 Variants of the dwarven spider higher than level 7 have access to short-range electric jolts that deal shock damage, and will explode a moment after being killed to deal further shock damage. These variants are easily distinguished from workers both by name and by the electrical special effects that emanate from their core. Dwarven spiders can be looted for Dwarven scraps, a very small chance at precious gems, metal ore, Dwarven Oil, and soul gems once killed. They are also the only kind of automaton that can be ragdolled with Unrelenting Force. There are two variants of Dwarven spiders both named Broken Dwarven Spider that can be randomly created by the Aetherial Staff, but spawn dead. The first variant (xx0142bc) simply dies and does nothing else, but the second variant (xx0121a9) spawns a randomized number of Dwarven scraps at its position when it dies. 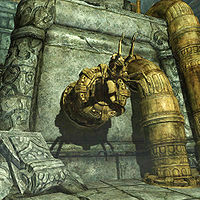 ^1Appears only in Dawnguard leveled lists for the final encounter of Lost to the Ages in the Ruins of Bthalft. ^2Is a possible summon of the Aetherial Staff. ^3This is the variant that exists in its port and leaps out to ambush the player when it gets close. Dwarven spheres are constructs that, unlike Dwarven spiders, were intentionally designed for combat. These spheres patrol Dwarven ruins in a condensed spherical form until they encounter a threat, at which point they rise into their semi-humanoid form and attack. Like Dwarven spiders, they can hide in Dwarven pipes and exit through ports to attack unsuspecting foes that wander too close. Basic Dwarven spheres utilize only melee attacks, but higher level variants use their arm-mounted crossbows to shoot powerful darts at targets with whom they aren't engaged in melee combat. Because their mode of locomotion is the sphere, their attacks involve a number of very speedy lunges that can close the distance between them and a target rapidly and are very hard to sidestep. When you kill a Dwarven sphere, you will find a number of items on its remains including Dwarven metal scraps, a small chance at precious gems, Dwarven Oil, a number of Dwarven bolts if Dawnguard is installed, and soul gems. There is a variant of Dwarven sphere named Broken Dwarven Sphere (xx0142bd) that can be randomly created by the Aetherial Staff, but spawns dead. Unlike the similar Broken Dwarven Spider automatons, there is no variant of the Broken Dwarven Sphere that spawns items on death. ^3This Form ID is used during the second ambush of the Kagrumez Gauntlet. ^4This Form ID is used during the third ambush of the Kagrumez Gauntlet. ^5During the second ambush of the Kagrumez Gauntlet, the spheres will have 0% resistance to shock; during the third this is increased to 99%. 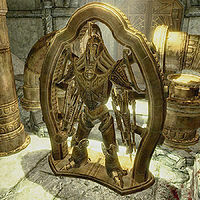 Dwarven centurions are the largest and strongest creations the Dwemer left behind after their disappearance. Designed in the form of a massively armored warrior with a hammer on one arm and a spring-loaded battleaxe on the other, they are formidable enemies that typically serve as the boss of their dungeon. In addition to their incredibly strong melee attacks which can be on par with those of a dragon, they can unleash a powerful steam breath attack that functions like a shout. Combining these features with the set of resistances that nearly all Dwarven automatons have and their very high health stats makes them an adversary not to be trifled with. Usually centurions are not found simply wandering around a Dwarven ruin, but instead are found immobile within their charging gantries until they are activated either by proximity, lever, or being attacked at range. This can oftentimes give ranged attackers a chance to get a few shots in with either their bow or a spell before the automaton can fully activate and engage in melee range. In some cases these great constructs are even used as traps to prevent any would-be treasure hunter from plundering the ruins they protect. If you are a low-level melee character, a surprisingly effective strategy is to get as close to them as possible, to the extent that your character is physically touching the centurion's legs. This is effective because centurions cannot lower their arms or tilt their heads to attack enemies beneath their shoulders, thus enabling you to encircle them and avoid their attacks with relative ease. Another great strategy is to get them stuck outside of a small hallway and get out of range of their steam attack, allowing you to hit it with ranged attacks. It is worth noting when facing them that they are immune to nearly all shouts except for Unrelenting Force, which causes them to stagger, and Marked for Death. Sometimes when using Unrelenting Force on a centurion before it has activated from within its gantry, it can be rendered inert and it will not activate immediately, enabling you to strike it at will for a time. When defeated, a centurion can be looted for a guaranteed Centurion Dynamo Core, a Grand Soul Gem, a number of Dwarven scraps, leveled arrows, and a few precious gems. 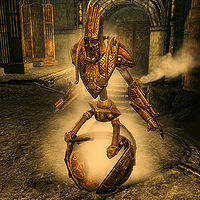 Dwarven ballistae are automatons that can be encountered on Solstheim in the Dwarven ruins located there. Also, with the addition of the Dragonborn add-on, they have been added to the leveled lists used in some Dwarven ruins on Skyrim, meaning you can encounter them there as well. Ballistae are ranged attackers that will make every effort to stay as far away from their targets as possible and assail them with high-power ballista bolts from a distance. Their attacks are particularly powerful, will stagger those they hit, and completely ignore the armor of their targets, enhancing their strength further. For this reason, they are high priority targets to remove as soon as possible whenever they are encountered. An effective strategy for combating them is to stay at range and evade their attack, and then rush them and attempt to defeat them before they have a chance to reload their ballista bolt. Much like other automatons, the ballista's inventory when destroyed includes Dwarven metal bits, Dwarven Oil, soul gems, and a decent chance at precious gems. ^1This ability causes every attack to have 100% armor penetration, but the in-game message only displays when you are staggered by the attack. This means that resistance to stagger will reduce only the chance of seeing the message, not the chance of armor penetration. The Dragonborn add-on added a couple of follower automatons to the game. 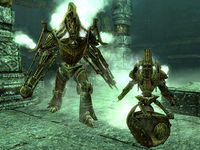 These automatons function identically to the corresponding automatons above in combat style and behavior, but are friendly toward the player, can be spoken to, and can be recruited to follow the player. These followers occupy the creature follower spot, and can thus be used alongside an NPC follower, but cannot be used alongside another creature follower. Unlike other followers in-game, these creatures do not level with the player, but instead have their stats fixed when the player enters the cell within which they exist, in this case Kagrumez's interior. 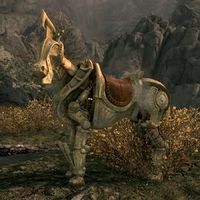 The Forgotten Seasons Creation adds a new type of automaton, a Dwarven Horse mount. It functions like a regular horse. Elder Knowledge: Recover an Elder Scroll to learn an Ancient Secret. 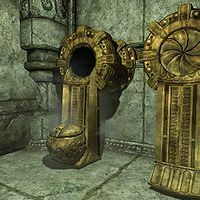 Discerning the Transmundane: Uncover the secrets of the mysterious Dwemer lockbox. Unfathomable Depths: Uncover the memories of the Dwemer. Grimsever's Return: Recover Mjoll's beloved sword, Grimsever, from Mzinchaleft. The Only Cure: Slay an apostate worshipper for the Daedra Lord Peryite. Revealing the Unseen: Learn the location of the Staff of Magnus. Lost to the AgesDG: Search for the Dwemer's Aetherium Forge. The Kagrumez GauntletDB: Survive the Kagrumez trials to claim a unique prize. The Path of KnowledgeDB: Discover the locations of the Black Books in order to stop Miraak. Dwarven automatons aren't much in the way of conversation, but the follower automatons found in Kagrumez do have some minor dialogue where they will hiss at the player with varying punctuation to showcase some semblance of emotion. If you manage to stagger a Centurion before it finishes its activation cycle, it may become stuck in place and unable to move. Lore:Dwemer — An article documenting the history of Dwemer society, culture, and more. Lore:Dwemer Animunculi — An article documenting the Dwarven automatons and their different representations in different Elder Scrolls games. Skyrim:Dwarven — A description of the Dwarven items that can be crafted in Skyrim. Skyrim:Dwarven Ruins — A list of all Dwarven ruins that can be found in Skyrim. Dragonborn:Dwarven Ruins — A list of all Dwarven ruins that can be found in Solstheim. The following books contain direct discussion on Dwarven automatons, not necessarily the Dwemer themselves. For a complete list of in-game literature discussing the Dwemer at large, see here. This page was last modified on 18 March 2019, at 23:48.